The new Star Wars Rebels Season 2 on Blu-ray packs a serious punch as we get to relive all the fantastic moments alongside the crew of the Ghost! One of my favorite memories from Celebration Anaheim was sitting in on the Rebel’s panel and listening to Dave Filoni and the full cast gush over how they can’t wait for all of us to see Season 2 of the Disney XD show. Just when I thought Star Wars Rebels could not get any better, Season 2 took fans to a whole new level with new bad guys, returning friends, and the Dark Lord of the Sith himself, Darth Vader! In this set you get all 22-action packed episodes along with a few bonus extras Star Wars and Rebels fans are going to want to check out! Not only does this set come with each episode from Season 2, but it also contains the great companion piece for each episode, Rebels Recon. Directly from the offices of Lucasfilm, each show digs deeper into each episode with all kinds of insights and interviews with the cast, writers, and director of Rebels! This bonus selection combs through the entire season and picks out easter eggs, hidden stories, and epic connections that link to both the future and past of the Star Wars saga. I figured I’d known most of these little nuggets, but I was surprised that there were quite a few I’d missed. This was fun selection to watch, but a bit short and I wished it was longer. The relationship between Anakin Skywalker and his apprentice Ahsoka Tano, from the Clone Wars, is well known. However, when that series ended, we were in the dark. Now, however, we see the triumphant return of Ahsoka, revealed at the end of Season One of Rebels, and now a major player in Season 2. This in depth look, which is an exclusive only to the Blu-ray set, is hosted by none other than Dave Filoni himself! Many secrets about pivotal moments in the season are described and discussed on how those scenes came to be. Not only this, but Filoni reveals a huge cliffhanger that is to come that will give fans goosebumps. 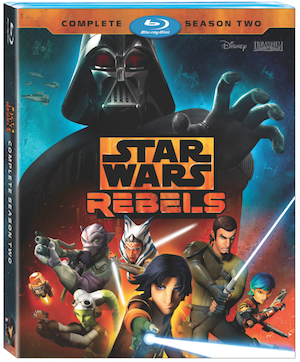 I loved Star Wars Rebels Season 2 on Blu-ray, and undoubtedly, you will too. It’s a great set to compliment the epic series that will look good on your shelf, next to the rest of your Star Wars collectibles. Note: A big thank you to Disney Home Video Entertainment for providing an advanced copy to review. Previous article New Star Wars Rebels Season 3 Preview - Enter Thrawn!